Britain wanted to take back control. Now it's begging Europe for more time. LONDON — One thousand days ago the British public voted to "take back control" — so the campaign slogan said — and leave what had been cast as the bureaucratic shackles of the European Union. On Wednesday, with just over a week left until the supposed Brexit date, Prime Minister Theresa May was forced to write a letter effectively begging E.U. leaders for more time to negotiate what has turned into a very messy divorce. The prime minister is perhaps weaker than she's ever been, squeezed by forces across the political spectrum — although mostly from within her own ruling Conservative Party — and with everyone baying for the Brexit outcome they favor most. Donald Trump Jr. added to the chorus of criticism late Tuesday, reiterating his father's claims that the prime minister would have succeeded had she listened to President Donald Trump. "Mrs. May ignored advice from my father, and ultimately, a process that should have taken only a few short months has become a years-long stalemate, leaving the British people in limbo," the president's eldest son wrote in the Britain's Daily Telegraph newspaper. Last year, May revealed that Trump had advised her not to negotiate but rather to "sue" the E.U. May agreed an exit settlement with the E.U. back in December but she hasn't been able to win the approval of British lawmakers. Most Members of Parliament dislike the deal for a variety of reasons and have handed the prime minister two crushing defeats in the House of Commons. The day before a pivotal E.U. 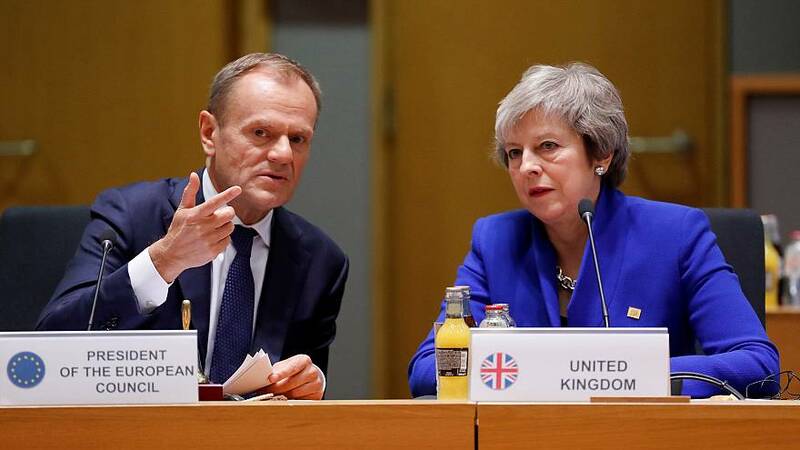 summit Thursday, May wrote to European Council President Donald Tusk to ask for an extension of three months to the Brexit deadline, which is currently set at 11 p.m. on March 29. It's now in the E.U. 's hands whether to grant that extension. But it is far from clear what an extension will actually achieve. The U.K. has failed to reach an agreement 33 months after voting to leave the E.U. And British lawmakers still cannot seem to agree on a way forward. It's also not certain that the other 27 countries in the E.U. will approve May's request. On Wednesday, European Commission President Jean-Claude Juncker said Europe had done as much as possible to accommodate the U.K., and that the deal already agreed with May would not be renegotiated. If Brexit gets delayed "then we are, I am sorry to say, in the hands of God," Juncker told Germany's Deutschlandfunk radio. "And I think even God sometimes reaches a limit to his patience." If there is no agreement by the exit date, Britain would crash out of Europe with a "no-deal Brexit." Although it has some supporters, this scenario would be an unprecedented act of economic self-harm, according to most experts. May also told Parliament on Thursday that she would seek to hold a third vote on her deal. She would likely need to tweak her proposal after being told earlier this week that, because of historic precedent dating back to 1604, she was not allowed to ask lawmakers to keep voting again and again on the same thing.